Yesterday was a holiday for me (June 24th is Québec’s national day), so I took advantage of the day off to make some progress on my sweater for the Nice and Knit summer sweater knit along (NKKAL). 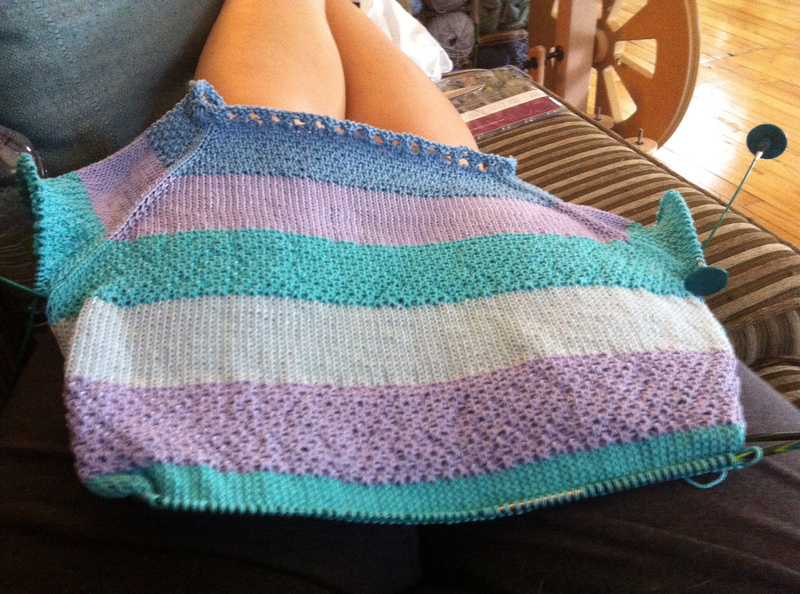 I created the pattern from scratch and named it the Sea Breeze sweater, the idea sprung up from the really beautiful Kit Camisole Cassy posted on her blog (knit the hell out), you should definitely check it out. 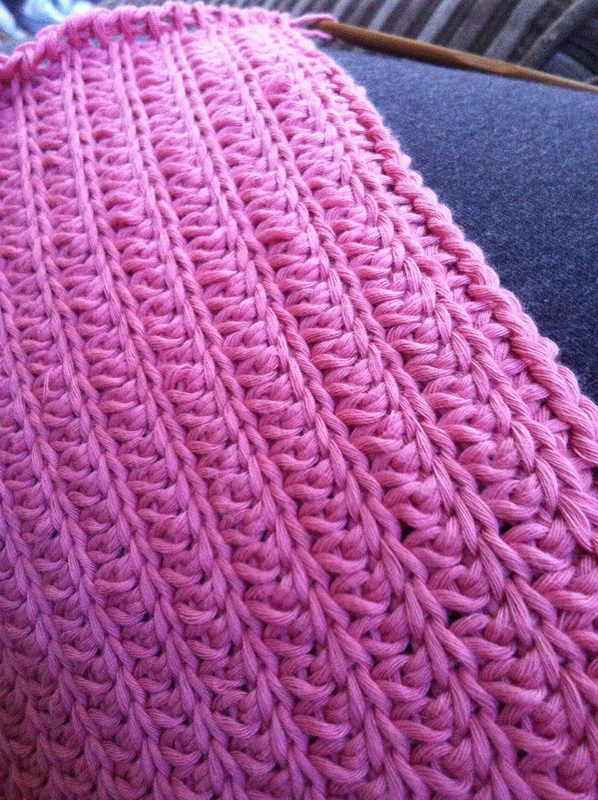 I thought the linen stitch that was used in this pattern was so pretty that I just had to use it somehow in my summer sweater project, so I came up with a plan. And to complement the nice stitch, I decided to use very soft summer colors; including a pale blue, baby blue, lavender and aqua. This yarn is really nice to knit with, it’s a 100% mercerized cotton from Austermann, you can buy it on Artfil’s website (you’re welcome). At this point, I have almost reached the waistline, so it’s really starting to look like something. I really can’t wait to finish it! On a different topic, I also spun last week the last bit of fiber I had 😦 So no more spinning for me this week. Do not worry though, I have a (considerably large) fiber order on its way, and this one should last me for a little while. 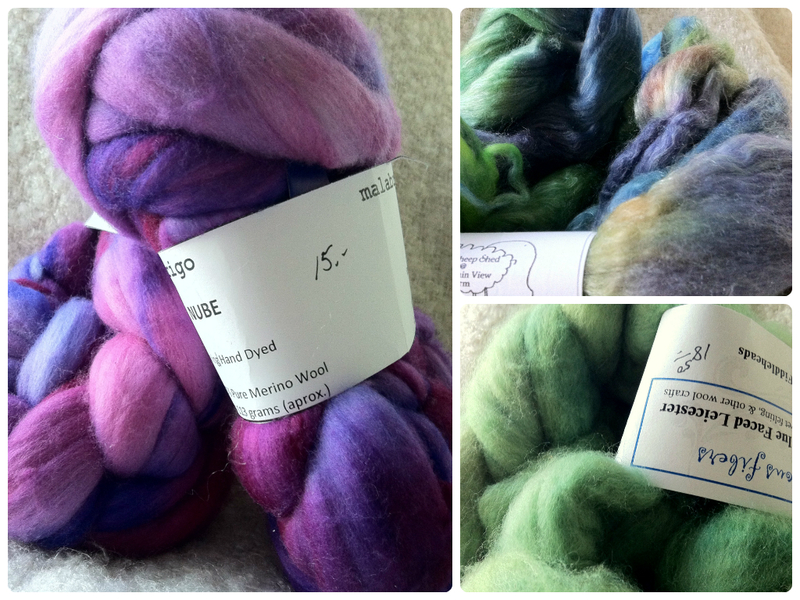 Since I have been mostly working with wool recently (BFL, Merino, Merino/Tencel, etc. 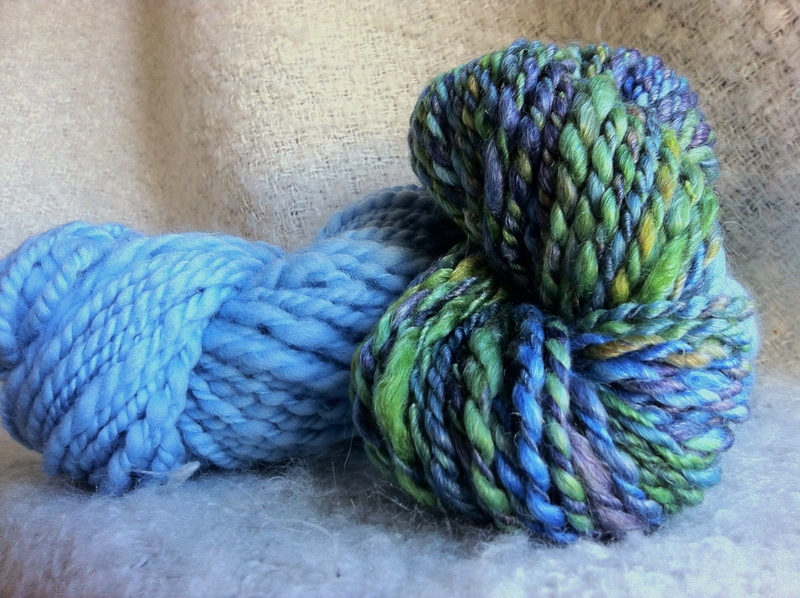 ), I decided to widen my horizons and (on top of the few ounces of wool I ordered) I also order different types of fiber I have never spun before. 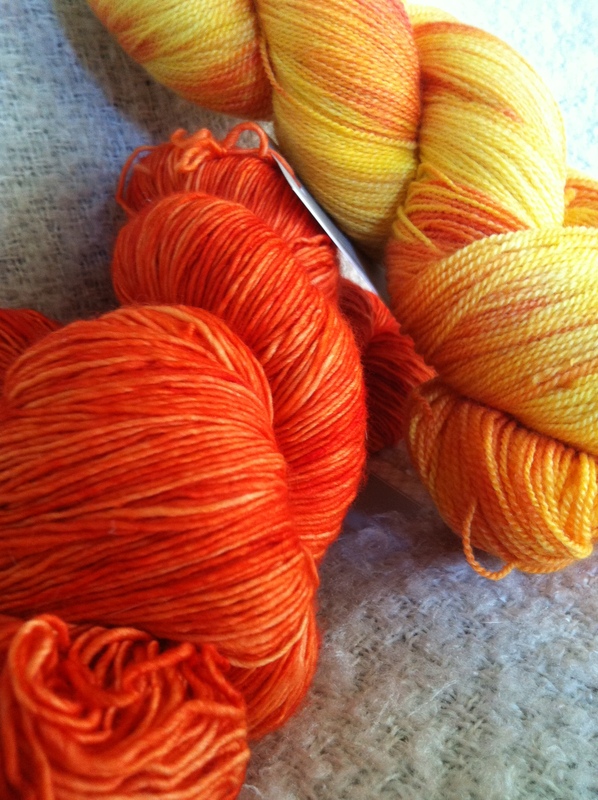 I ordered bamboo, 1lb of natural bleached cotton (so I’ll also be trying my hand at dyeing – W00t!) 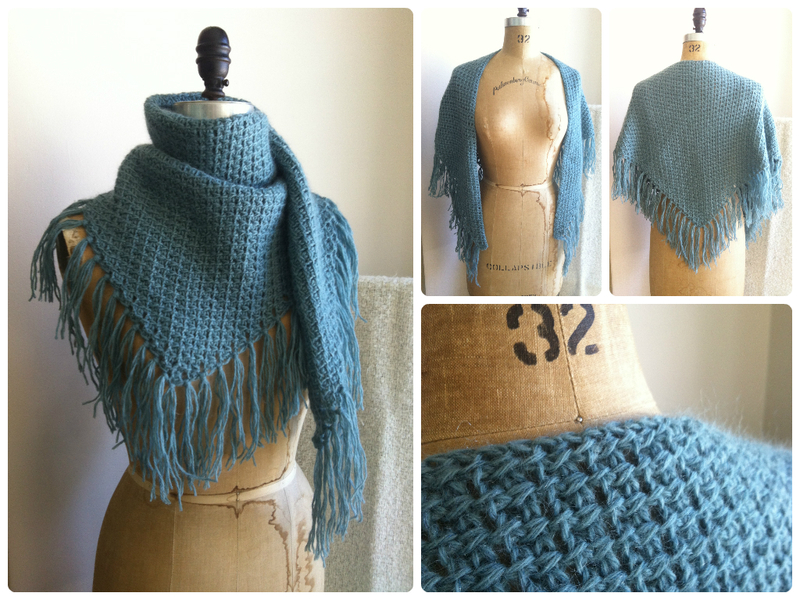 and an 8oz of merino/silk fiber. I simply cannot wait to get them! Weehee! I affectionately name it Cheshire Cat. I think I’ll be making a sweater out of it, maybe something like the the Pull me over ? or maybe the Briar Rose Tunic ? I’m not quite sure yet. Anyways, there’s still plenty of time left to decide since I’m not even half way through my Sea Breeze Sweater, and I still only have about a third done on my Spring Leaves shawl. Plus, I might not be knitting all that much this week since I finally got my future-mom-in-law’s rhubarb pie recipe so I’ll definitely be baking that some time this week. Hmmmmm, scrumptious! So that’s all for today folks 🙂 Enjoy your craft time! This entry was posted in Crafts, Knitting, Spinning and tagged art, cotton, craft, fiber, knit, linen stitch, passion, spinning, stripes, sweater. 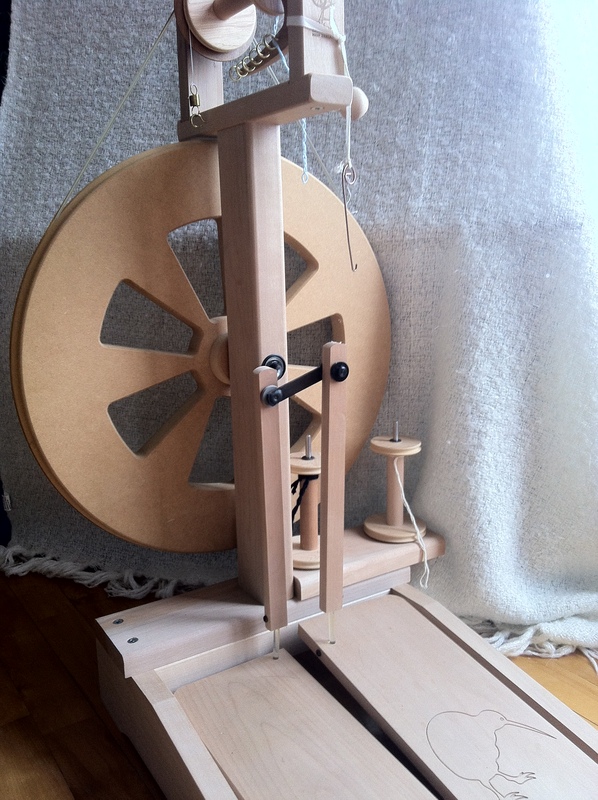 So… I bought a spinning wheel. I don’t know why, kind of a spur of the moment thing, it just kind-of-sort-of happened. 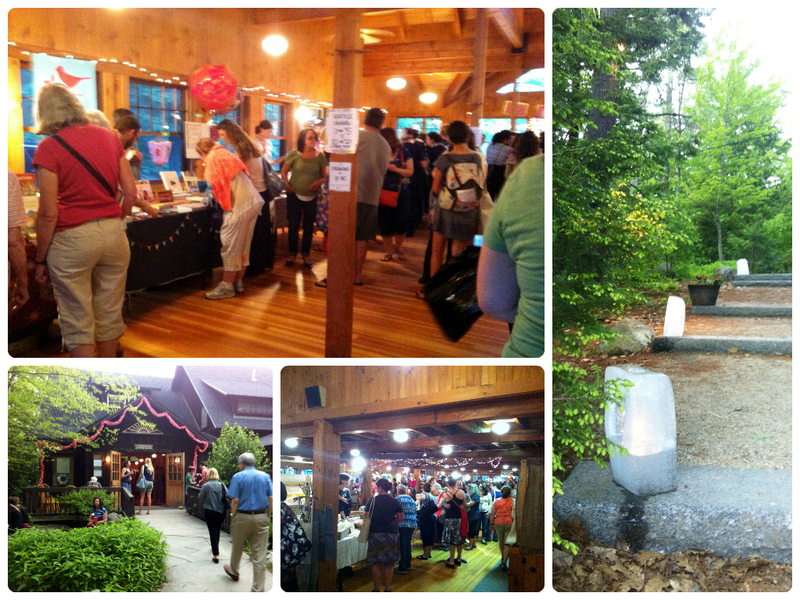 It all began a few weeks ago, as I was at my friend Yana’s shop, happily chatting with an acquaintance I met there. During the conversation, I brought up the fact that I have never tried spinning, and would probably like to try it out eventually since it’s one of the few fiber crafts I have never tried before. She looked at me, and casually replied that she has tried it before but couldn’t really get into it, so now she has a spinning wheel for sale. Coincidence? I got there around 6 in the evening, and went through a very intense 3 hours learning session. Don’t get me wrong – I DID do my homework beforehand and looked up some videos on YouTube to give myself an idea of what it was like to spin; but SEEING a video and actually DOING the motions are two very different things! Boy, I had a good laugh. Obviously, my first try was very thick and thin, over-twisted in some spots, under-twisted in others and (as a general rule) very ugly! I was working with a pale baby blue merino top fiber, the fibers were very long and just trying to get used to the motions, trying to find where to place my hands and how to coordinate them with my feet was already such a big challenge that I didn’t/couldn’t really watch (or care about!) what the single I was making actually looked like, as long as I was making something! There are so many different things to focus on at the same time while spinning, I just couldn’t believe it! But all in all, I ended up having a lot of fun, and at the end of the night, I bagged all my stuff, said thanks, paid for the spinning wheel and left with it. I took the not so fashionable baby blue merino top fiber home with me, and I started buying a few other roving here and there to build myself a little fiber stash. 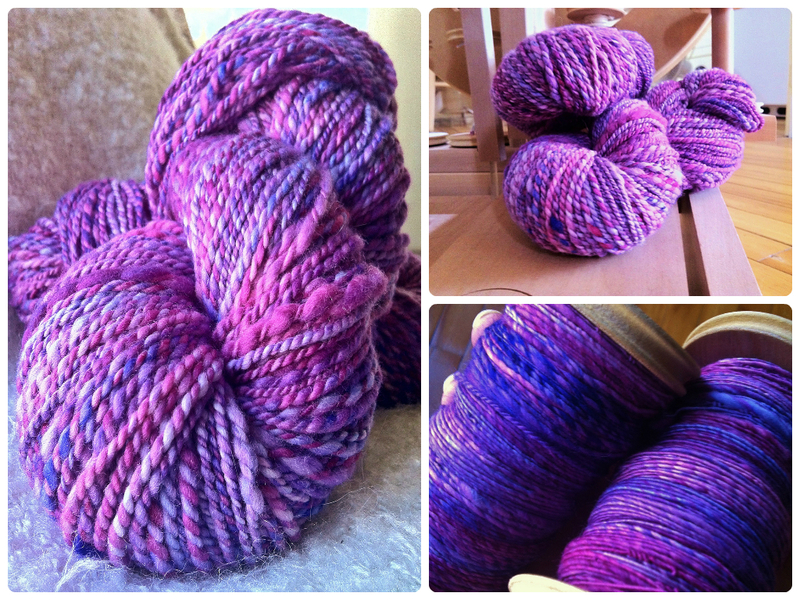 As I was out shopping in Stowe (VT) on Sunday, I fell in love with an amazing variegated purple Malabrigo Nube fiber, so I bought it right away – you can see what it looks like on the photo at the top – isn’t amazing? This entry was posted in Crafts, Spinning and tagged art, craft, fiber, knit, passion, spinning, yarn.